If you’re the owner of a 4K TV or newer HDTV, A/V receiver, soundbar, or home theater in a box, you’ve likely noticed a little symbol on one of the device’s HDMI inputs that says “ARC” or “HDMI ARC.” What do these symbols mean? Hint: It has nothing to do with geometry, nor does it have anything to do with the reactor that powers Iron Man’s suits. ARC stands for Audio Return Channel, a little-understood protocol that started showing up on HDMI-equipped devices a few years back before evolving into a now-ubiquitous standard. The technology is especially useful and has the potential to significantly simplify your home entertainment system. We’ll go over the basics of ARC so you can put its powers to work for you and explain how ARC is about to get even more powerful with an update called eARC. First, a quick refresher on HDMI itself (feel free to skip ahead if you just need to know about ARC). HDMI has been around since 2004. You probably use it now, but you may not know how versatile it actually is. The system was created as a faster, more efficient way to deliver high-quality digital video and audio to and from consumer electronic devices. A constantly evolving format, HDMI 2.0b was a baby step up from HDMI 2.0a, allowing for more capable transmission of 4K Ultra HD video with HDR at up to 60 frames per second, as well as the ability to transmit information for up to 32 channels of audio. Don’t freak out, though! The HDMI 2.1 format is fully backward compatible with all older hardware, so this does not spell certain obsolescence for your existing entertainment system. 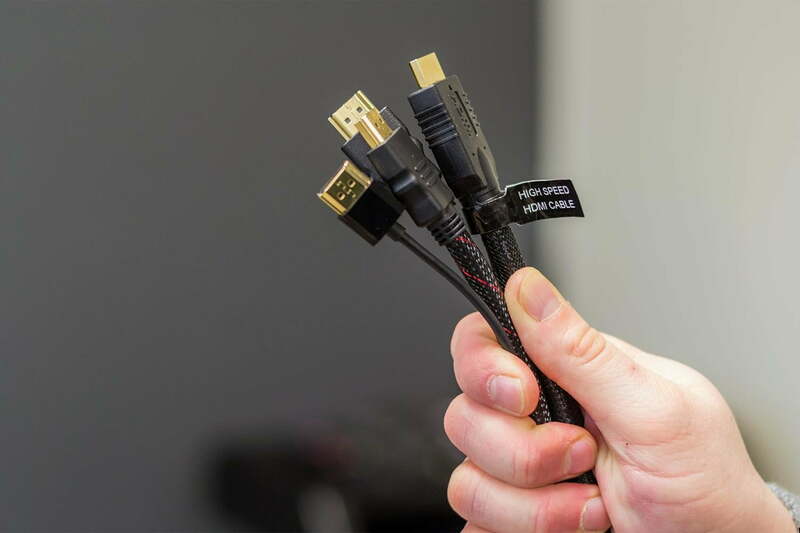 While it is true that you will eventually need a new Ultra High-Speed HDMI cable to take full advantage of the spec’s new features, that need is still only on the horizon for even the most enthusiastic early adopters, and even further out for most of us. Back to present day: Many people currently use HDMI strictly as a means for connecting their cable boxes, Blu-ray players, and game consoles to their TV, but that little cable connection can do so much more. HDMI was also designed to carry what the industry refers to as “handshake” information from one device to another. Besides transferring both video and audio in a single feed, HDMI was also designed to carry what the industry refers to as “handshake” information from one device to another. These shared transmissions were originally intended to communicate copy protection data to prevent piracy and transfer messages about what type of components were connected to each other, as well as what their capabilities were (and weren’t). But the system was also designed to share more complex messages as a part of what’s called Consumer Electronics Control (CEC). CEC lets a single remote control operate features on up to 15 connected devices. There are nearly as many names for CEC as there are electronics brands: Samsung has called it “Anynet +,” LG “SimpLink,” and Sony “Bravia Sync.” Unfortunately, the system has never really lived up to its potential, and is often mistranslated or simply lost between components from different manufacturers. ARC can help. ARC, along with help from CEC, can simplify your home theater system in two important ways. The first, and perhaps most useful feature HDMI ARC brings to casual users, is the ability to use one remote for all of your audio device’s most common functions. For this example, you may need to go into your TV’s settings and activate CEC, usually found in the general settings. Once everything is set up, your TV remote should power on a range of devices from A/V receivers to soundbars like the Yamaha YAS-207 at the same time as your TV, and control volume as well. Simplicity is the name of the game here. 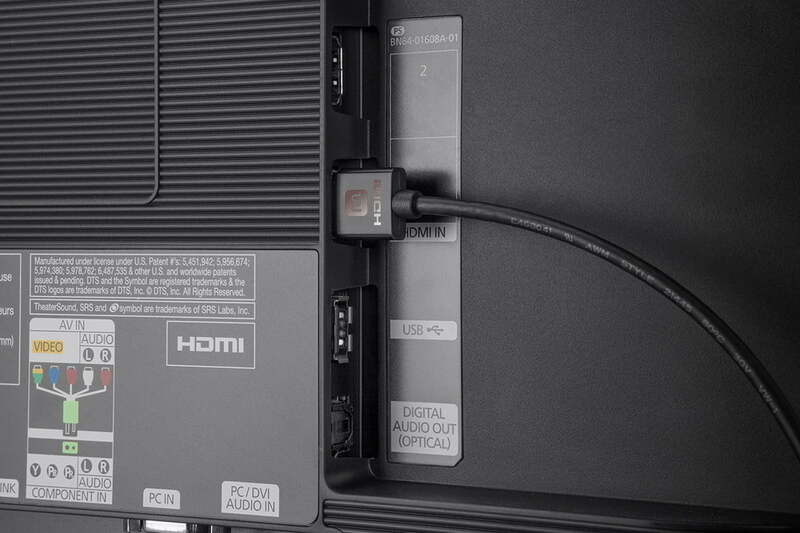 The HDMI ARC port can also be handy for connecting outboard components like streaming devices, making controlling them easier. Plugging a Google Chromecast into your TV’s ARC port, for instance, may allow you to automatically switch sources or even turn on your TV when you click the cast icon on your phone or tablet. You may find similar results with other components as well, including Blu-ray players. 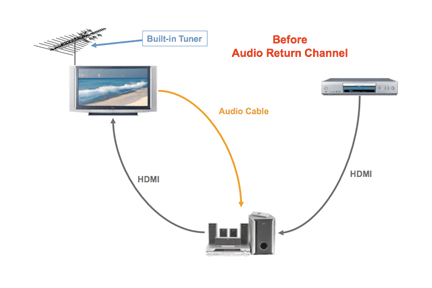 As touched on above, the primary function of ARC is sending audio signals both “upstream” and “downstream” over a single connection, meaning signals can travel in and out of a device over a single HDMI ARC port. “Downstream” refers to a signal that is being passed from the source, say a Blu-ray player, “down” to another device. “Upstream” would then mean sending a signal the opposite way over the same cable. Why is that necessary? Convenience and sound quality. For those who use an Audio/Video receiver (or a soundbar with multiple HDMI inputs) as a hub instead of their TV, ARC can simplify cable connections. While audio and video from various sources are going directly to an A/V receiver in this kind of setup, any audio coming from the TV itself (say, from local broadcasts or onboard streaming apps) still needs to get to the receiver or soundbar somehow. HDMI ARC can send audio to the receiver through the same cable that already connects two devices. For example: Let’s say you want to use your television’s built-in streaming apps over apps built into your Blu-ray player or streaming device. Any audio from those streaming apps, like Netflix, Hulu, etc. — or audio from an over-the-air antenna — needs to get to your receiver somehow. In the past, this would have required that you connect another cable like an optical digital audio cable to link your TV with your receiver. But with HDMI ARC, audio can be sent back to the receiver through the same cable that already connects the two devices. For those with wall-mounted TVs, that’s one fewer cable to snake through the wall! Let’s say you don’t have an A/V receiver, though. As noted above, many soundbars — from Yamaha’s affordable YAS-207 to Samsung’s powerful HW-N950 Dolby Atmos soundbar — also include HDMI inputs to allow a direct connection from a Blu-ray player or other source, which enables you to better preserve the audio quality. If you think that sounds great, just wait for eARC, which is already shipping in some devices. As we explain in more detail below, with eARC, your TV’s audio-processing capabilities are no longer part of the equation. You will be able to get the very best surround sound to any of your audio devices with no compromise. Today, many TVs dumb down and compress audio signals before passing them down an HDMI cable, while others do support more channels and even Dolby Atmos, albeit using a more compressed codec like Dolby Digital Plus instead of Dolby TrueHD, which requires too much bandwidth. With eARC, the original, full-resolution audio signal can be sent via the HDMI cable — again, producing the very best sound with no compromises. You can already connect audio components to your TV via the HDMI ARC connection to pass the video signal to the TV and receive audio back from the TV as well. With eARC, that connection just gets better, with no degradation of the audio signal imposed by your TV. We’ve teased some of what eARC can do, but here’s a little more explanation on how it works, and other benefits it offers. The “e” in eARC stands for enhanced Audio Return Channel, and is a new standard feature of HDMI 2.1 that aims to provide the best possible audio resolution from your TV. The new configuration will require eARC support from both your TV and your audio device, which means both devices must support HDMI 2.1 — older HDMI versions will not support eARC. You’ll also need an HDMI cable with support for Ethernet, like the newer Ultra High-Speed HDMI cables, which do include Ethernet support. 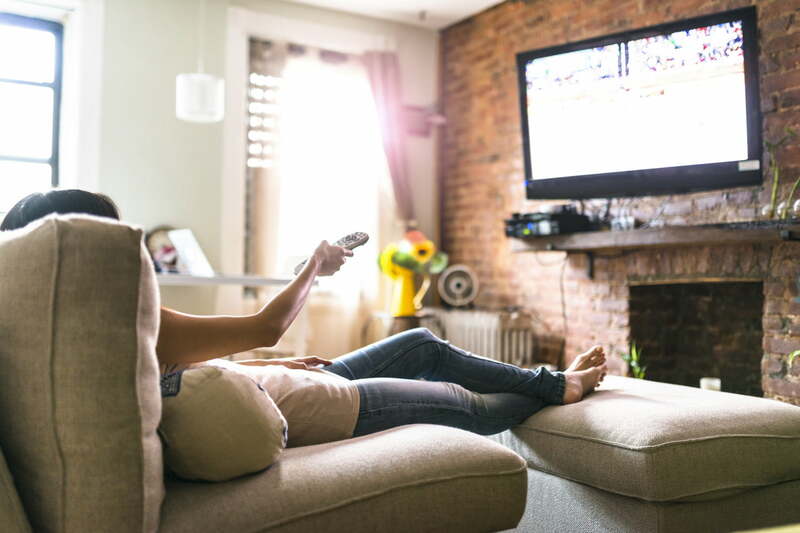 With eARC, full-resolution sound signals — including 3D surround sound formats like Dolby Atmos and DTS:X — can be passed back and forth from your TV and audio systems. That’s true whether they come from over-the-air broadcasts, internal streaming apps, or Blu-ray players or game consoles connected directly to your eARC-enabled TV. Previously, decoding high-bitrate audio like Dolby Atmos often required plugging your source device directly into a compatible audio/video receiver, soundbar, or powered speakers, as most TVs are limited to outputting compressed surround sound or even stereo audio. With eARC, you’ll be able to plug your HDMI devices directly into your TV and the TV will then send the uncompressed, high-quality audio to a soundbar, receiver, or amplifier directly from the eARC port. What’s more, since the HDMI 2.1 spec offers faster data transfer with more bandwidth, both the audio and video signals can be synchronized automatically. Ever had trouble with lip-sync problems? Those issues will be a thing of the past with eARC. In theory, this new protocol also means manufacturers could create a new wave of audio-only receivers, soundbars, and amplifiers, as your TV would be able to handle the video signal, while still allowing for the highest-quality audio to make its way to your sound system. This could significantly reduce the cost of all kinds of home theater components. Obviously, it will take a while before eARC is everywhere, but when it is here, we’ll enjoy a new level of simplicity and flexibility. So far, companies that have made their eARC plans public include Sony, talking about its soundbars and TVs, as well as Denon, Onkyo, Marantz, Yamaha, and Sony in regards to their A/V receivers. With that in mind, it’s important that we point out that new technology takes time to become widely available. Don’t hold off on buying that new receiver or 4K HDR TV you’ve had your eye on. HDMI 2.1 is a very forward-looking, future-proofed technology, but it is still in its infancy, and while very small corners of the world have begun enjoying 8K content, most of us are still waiting for the full incorporation of 4K content into our setups. In other words, this is a gradual evolution and not one that should keep you from enjoying the still-burgeoning world of 4K HDR TVs and Dolby Atmos/DTS:X-enabled audio devices. Like all technologies, the future of home theater is announced and planned long before it becomes the standard. Yes, it is impossible to stay on top of the very latest and greatest from home theater land — and that’s OK.